Want to go low with something different this time? Maybe you’ve fallen in love with Malik and your game style has changed. The Malik HEAT is the only stick in their current range with a low bow profile so your choice is limited. Though limited in choice there are low bow sticks from Malik and the Malik HEAT is a great option for a number of reasons we will go through in this review. First up is the position of the bow. We file every bow position in Extreme low (normally 200mm from heel) Low bow (normally 220/225mm up from the heel) and higher. Malik once again have blown our generalisation out of the window with a bow at 210mm up from the heel in the new multi-curve shaft on the Malik Heat review. How did we find this position to play with? Well, like the dribble curve from Malik we expected the 210mm position of the bow on the HEAT to be just awkward. Again we are pleasantly surprised. It just kind of feels right. A cm might not sound like a lot but it is noticeable. Extreme low bows are really extreme, low bows are great and Malik just offer something in-between with the multi-curve, it’s a great contrast between the two. Plenty of lowness to flick and pick the ball up, lots of control with a slightly higher position. For some random reason Malik has dropped the carbon content slightly in the Heat, at 85% carbon it’s not exactly low and you still get a great stiff feel in hits. One of the best features added to the 2015 is the silicon wrap. Have you used an Osaka stick? If you have it feels like that. If you haven’t I will try and describe it. The wrap is basically a coating of carbon around the head and shaft of the stick. It means the Malik Heat makes a satisfying ‘tink’ noise when you hit the ball which comes off the stick a little harder and truer than not having it. With this best feature on the Malik Heat it really doesn’t matter that our review is that the stick only has 85% carbon, it still hits the ball like a dream. Because you can see with your own eyes what the Malik HEAT looks like I won’t waste time in this review talking about that, I do just want to review the weight of the Malik Heat. It’s light, nice and light. At the lighter end of the ‘light scale’ my 36.5” Malik Heat felt amazing to run round the pitch with and because it’s so light you can swing fast and really connect with the ball. All-round my review of the Malik Heat is that we have an awesome low bow stick here from Malik. Personally I would choose another brand who are better known for low bow if I was buying one. 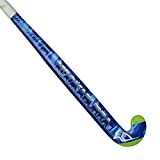 The slightly different curve position, the Malik quirkiness and in particular the carbon wrap are the key features of the review that make this hockey stick a great purchase.